Gerald Cleatis Hinshaw1,3,4 [Cleatis G. Hinshaw5,6,7]. Hinshaw, Cleatis, head-of-household, age 25, born in Idaho; father born in Kansas; mother born in Idaho; single; rented home ($10 rent); no radio in home; occupation: laborer, farm. Favre, Felix, lodger, age 48, born in Oregon; father born in France; mother born in Canada (French); single; occupation: laborer, odd jobs. 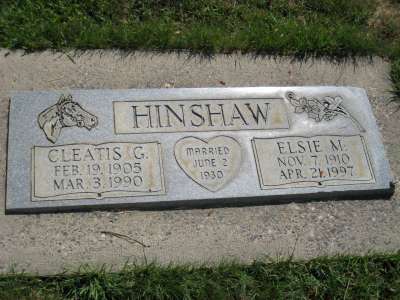 Hinshaw, Cleatis G., head-of-household, age 35, born in Idaho; completed 1 year of high school; on Apr 1 1935 was living in rural Washington County, Idaho; owned home ($1000 value); occupation: laborer, common; worked 32 weeks in 1939; $800 wages in 1939. Hinshaw, Elsie, wife, age 29, born in Idaho; completed 4 years of high school; on Apr 1 1935 was living in rural Washington County, Idaho. Hinshaw, Clarence, son, age 9, born in Idaho; completed 1st grade; on Apr 1 1935 was living in rural Washington County, Idaho. Hinshaw, Lawrence, son, age 4, born in Idaho; parents born in Idaho; mother tongue / native language: Finnish. 1940 census, McCall, Valley County, Idaho; roll T627-755, ED 43-7, page 1B, line #65, household #18. Contribution from Tony Alan Hinshaw. http://abish.byui.edu/specialCollections/fhc/newMarriage/searchForm.cfm (vol. 3, pg 17). 1930 census, Cambridge, Washington County, Idaho; roll T626-404, ED 17, page 3A, line #43, dwelling #64, family #65. 1930 census, Cambridge, Washington County, Idaho; roll T626-404, ED 17, page 3A, line #45, dwelling #65, family #66. Obituary of Ellen S. (Hillberg) Paananen; "The Idaho Statesman" (Boise, Idaho), Oct 02 1998.